The leaked FlingSmash boxart led to a later confirmation of the existence of Wii Remote Plus, and now we know the date when European gamers can get their hands on the game and device: November 19th. The game will come with the black Wii Remote Plus, but there's no official word on how much the bundle will cost at retail. We'll do our best to find answers, but in the meantime you can read our FlingSmash First Impressions about why this bizarre platformer could be a fun little outing. ENJOY A SMASHING AUTUMN WITH NINTENDO! Get ready for the launch of a smashing new game from Nintendo – FlingSmash, a unique game from Artoon that combines the hands-on fun of tennis with the non-stop action of pinball, launching across Europe for Wii on 19th November 2010. The software also comes bundled with the new Wii Remote Plus accessory. When the tropical Suthon Island is invaded by the evil Omminus, our ball-shaped hero, Zip, is summoned to save the day. 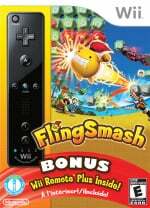 Adding to all the excitement, Flingsmash will come bundled with the new Wii Remote Plus, a Wii Remote with the built-in Wii MotionPlus functionality. This addition mirrors your exact movements while you play, allowing greater accuracy as you fling Zip at targets to smash your way across eight colourful worlds. From sandy beaches, lush tropical treetops and even underwater grottos, there is so much for you and Zip to explore. The game is a classic action sidescroller in which you fling Zip at particular angles to smash objects, such as enemies or bricks, or travel down corridors. Left handed players can flip the game and position Zip on the left side of the screen – scrolling left to right. As you progress through the levels, Zip transforms into different ball types, each offering a unique challenge. Zip might be shrunk down, fattened up or turned into a heavy steel ball which requires a huge fling to get him moving through the levels. In other levels, the action is turned on its head as you scroll vertically instead of horizontally. You need to collect at least three of the five medallions hidden on each level in order to advance onto the next stage and as many points as possible by smashing blocks along the way. 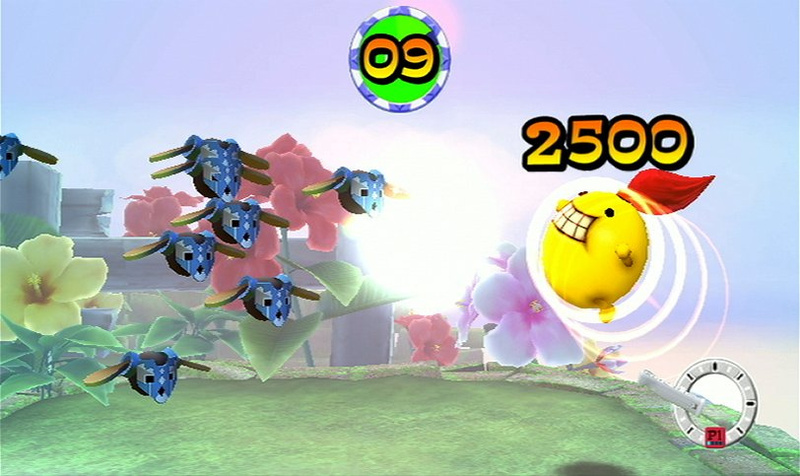 You and a friend can team up using an additional Wii Remote Plus (or Wii Remote with Wii MotionPlus accessory) with the second player controlling Zip’s adorable friend, Pip. There are also eight unlockable mini-games and eight extra levels to discover - all playable by one or two players. Use the Wii Remote Plus like a racket and watch Zip bounce around like a pinball to smash through oncoming barriers and enemies in this action packed sidescroller, launching on Wii on 19th November 2010. Great news! I thought FlingSmash was good fun when we played at Ninty's media event waaaayy back in Feb. Perfect for a quick pick-up-and-play and a good demo of how accurate MotionPlus is. Hope this comes to America! FlingSmash seems pretty fun! Looking forward to the review on this one, sounds intriguing. I think this game sounds smashing. Quite "smashing" indeed. Does anybody know when this game (or the Wii Remote Plus, better yet) will hit the States? I wanna trade those MotionPlus accessories and some of my remotes to Gamestop! Was on my radar already and this further's its appeal for me. Cost? This was confirmed for a November 7 release way back in August! @NL On the Nintendo site it says the Wiimote Plus will come to Europe in early November in four colours, Black, White, Blue and Pink. Looks fun. Might rent it. Sounds good this package but I don't want to get it in white! blue or red will be fine with me. Nintendo are releasing a red wii soon I'd like to think that they will release red nunchucks and wii-motes! Nintendo has Christmas covered. However I would like Nintendo to announce the new Red Wii with New Super Mario bros and Mario All-Stars to be announced for Amercia, I don't live in the U.S but I'm into fairness. can't wait for the new controller!